Lately in new buildings I've started to see dual flush toilets. I think I saw some at an airport somewhere. 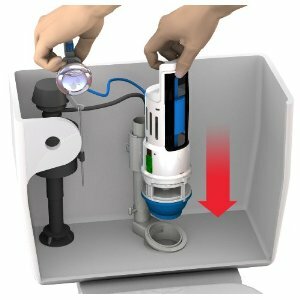 The dual mode allows you to flush a small amount of water for liquid waste and a normal amount of flush for solid wastes. The result is that you use less water to flush only liquid wastes. This can save a few bucks on your water bills. It makes good sense for a public restroom that gets a lot of traffic like an airport. In a private home the water savings really wouldn't justify buying a brand new toilet. However for around $20 you can convert your normal existing toilet to a dual flush toilet. You can do this via a converter product. The product is called the MJSI HYR270 HydroRight Drop-in Dual Flush Converter . They have it at Amazon for $20.59 right now. The converter product has product has pretty good ratings on Amazon. However it doesn't work on all models or styles of toilet so it is important to read the details on it to make sure it will work for your toilet. Our water costs 0.33¢ per gallon. So it would take about 6200 gallons to recoup the $20.59 cost. If you save 1 gallon per flush then you're looking at about 6200 flushes. I won't hazard a guess how often people flush their home toilets. But I figure an individual is likely to use the toilet at least 1 time a day. A family of four would save enough on their water bills to pay for the converter in a bit over 4 years or less. This converter should pay for itself fairly easily within a few years for a family with multiple users. It probably wouldn't be very good return on cost for a single person living alone. Of course YMMV based on your water costs and usage. I heard about this one on the FatWallet forums.